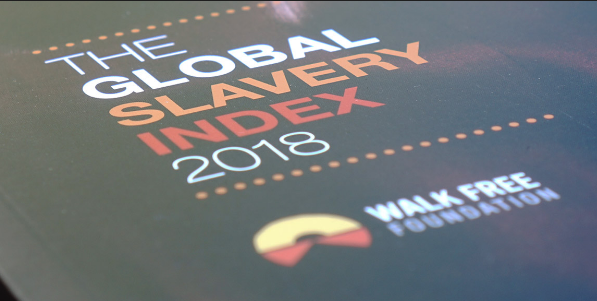 The 2018 Global Slavery Index published by the Walk Free Foundation ranks countries based on the prevalence of modern slavery, with North Korea and Eritrea topping the list. One out of ten citizens in North Korea are victims, a sobering statistic that is further explored in Walk Free’s related report on understanding modern slavery in North Korea. What happens to trafficking survivors after they are ‘reintegrated’? Following the lives of 128 child and adult survivors of human trafficking over nine years, the Chab Dai Coalition’s Butterfly Longitudinal Research Study compiled the top ten findings to illuminate the experiences of survivors after they are reintegrated back into their communities. The study found that 36 percent of females who were reintegrated have since reentered into exploitative situations. An article in Science Advances features the Labor Safe Screen, a risk assessment tool to help seafood companies identify blind spots in their supply chain and prioritise actions required to tackle forced labour. The tool has been tested on 118 seafood products from 18 companies, triangulating data from suppliers, human rights authorities and workers. High youth unemployment among young Ethiopian women is leading them into risky forms of employment, including domestic work. Based on survey data of domestic workers within Ethiopia’s borders, a paper in The Service Industries Journal finds that completing their schooling and transitioning to better employment are huge challenges for these young workers. A new report published by Stanford University’s WSD Handa Center for Human Rights and International Justice reviews promising practices and challenges of good data among anti-trafficking organisations in Southeast Asia. Although digital data is fast becoming the norm, a general lack of capacity means that the data is not typically standardised nor is it utilised to inform policies and practices. A handbook by the International Organization for Migration offers guidelines and tools for identifying and supporting victims of trafficking in Hong Kong. A report by FLEX examines transparency in supply chains and draws on case studies from the UK and Bangladesh. An article in ScienceDirect summarises the evidence on interventions for preventing intimate partner and sexual violence in low-income countries. Polaris’ new report maps the systems and industries to prevent and disrupt human trafficking.